The Last Starfighter and Wargames have set some pretty high hopes from gamers about a world where games have a hidden agenda, be it positive or negative. As gamers we don’t actually have many urban legends or conspiracy theories, like the programming that provides the entertainment we are binary in nature, something is generally true or a load of hogwash. Every so often though there is something that piques the interest of our digital generation; Slender Man, Herobrine and finally Polybius. 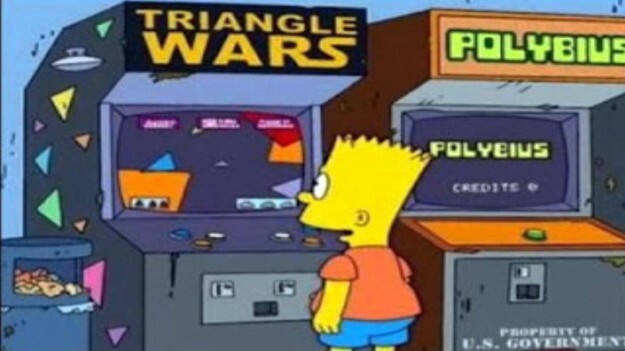 Finding out what’s true and false with Polybius is challenging to say the least, this is the story as I originally heard it, and the various theories and rumours that surround it. 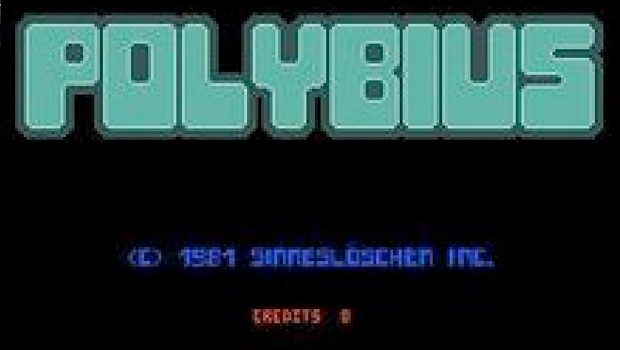 In 1981 a game was made, Sinneslöschen Inc produced an arcade machine, a simple tall black box, no art work apart from a marquee along the top that read Polybius. 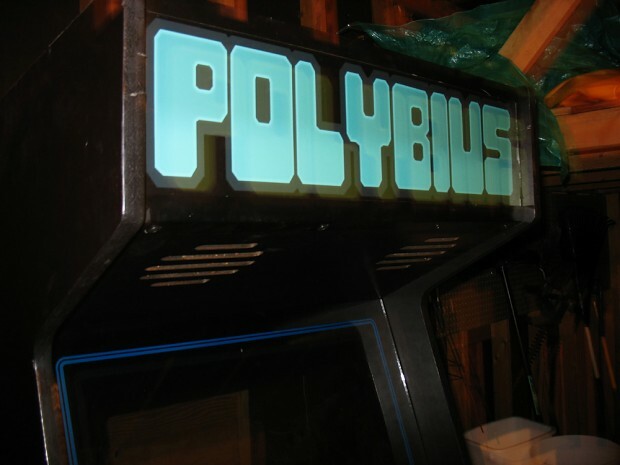 Polybius was a simple arcade game, similar in style to the hit Tempest. 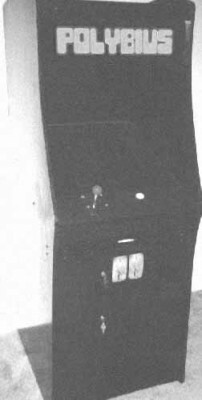 According to reports (again rumour and fact are all wavy in this tale) it mixed Tempest gameplay with pseudo Pac-Man game puzzles, there were only a handful of machines built and for some reason Sinneslöschen Inc put these machines in arse crack of no where places like the suburbs of Portland, Oregon and Virginia. This is where the story goes into the realm of “….The hell?”. Apparently a few kids and adults decided to try their hand at this unknown new machine, they rocked up and slipped in their quarter, swept back their flock of seagulls and commented about the awesomeness of Blondie, Bowie and Roxy Music (My point is that this was the 1980’s). Upon playing the game a select few came down with symptoms of illness including; Nausea, Headaches, Melancholy and, worst case, Suicidal Tendencies. We as level-headed human beings know this is crazy, sure subliminal messages are scientifically proven to work on susceptible victims, but who would want to make this low-level attack against America? Well apparently the CIA were behind this, Bar and Arcade owners who had the Polybius machine all report seeing ‘Men In Black Coats’ coming to their establishments and taking away information from the Polybius machines. So there you have it, the government in 1980’s America wanted to take out drunks and nerds. The reasons behind this? Well supposedly this could just be a case of the CIA need to test their new subliminal message software out on someone, it could be that this was just bad luck, like the Pokemon episode in the 90’s that caused thousands of kids in Japan to freak out and have epileptic fits. The most obvious answer? Well it’s all just a really good story. This is pure bat poop crazy mental conspiracy theory tin foil hat stuff. Though how much of it is? Some people think that this is all a hoax from some Usenet nerds, much in the same way Slender Man came to be. Others think that this is just a bastardisation of the Tempest arcade machine which made many people ill. In 2008 a man called Steven Roach added fuel to the mental fire by claiming to be a dev working for a South American company that had the Sinneslöschen under it’s umbrella, they released Polybius but it unintentionally made people ill. This was all in an article posted up by a writer over at Gamepulse.co.uk (http://web.archive.org/web/20080507174244/http://bitparade.co.uk/modules/articles/article.php?id=21) they decided to probe this Steven Roach. His answers seem plausible but there are just too many issues with the legend and this “truth” for it to all be real. Sinneslöschen translates as Sense Delete (through Google Translate) and at that stage this whole thing falls apart for me. The idea that the CIA would create a game that manipulates people to such a degree and then leaves this smug nod and wink to conspiracy theorists is just a little too sloppy. When Slender Man was first launched onto the world from the Something Awful forums, there was an influx of fan art, youtube mini-series and games; Polybius is no different. 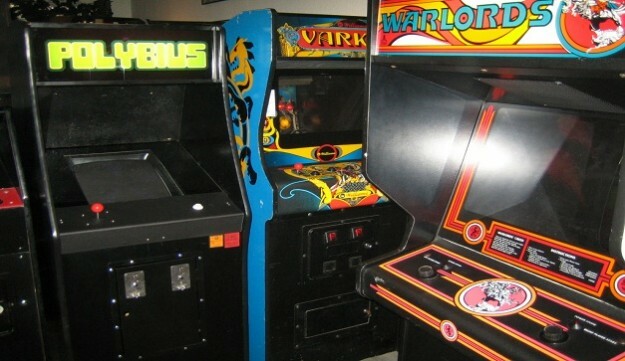 There are many ‘versions’ of Polybius, all playable games that will give you a headache, are any of them genuine? Unlikely, as is always the case with Urban legends the facts get pushed aside quite quickly, and soon all you are left with is a crowdsourced/hivemind tale to freak people out. In 2006 the Simpsons made a reference to the machine in the episode “Please Homer, Don’t Hammer ‘Em”, you will notice at the bottom of the machine it says “Property of U.S. Government”, the fact that the Simpsons is ragging on this story as well doesn’t do much for its legitimacy. So where does this all leave us? Well if nothing else this is a great urban legend, something that as gamers we are severely lacking, in this internet age we don’t have the joy of kids in the 70’s, the Bigfoots or the Chupacabras, it’s all too easy just to Google and disprove something, basically all I’m asking is that as nerds we just let this one slide and let’s collectively agree it’s true.